At least 5 to 7 times a week, someone finds Hannah’s blog by searching “Gaucher type 2” or “Gaucher type 3” or some variation thereof. Since she passed away in December 2011, I still receive emails from newly diagnosed families looking for support and information – and I am so glad to be able to be there for these families! Please, please don’t be afraid to contact me if you are searching out information on Gaucher’s type 2 or 3. Even though we lost Hannah, my resolve is just as strong to help other families who have children diagnosed with Gaucher’s. Even if I can’t help you, we have such an amazing community of Gaucher moms and dads who are a wealth of support and information. If you have a child with this diagnosis, you are not alone. You just need to reach out to me so I can help you find the support and information you need, whether it is a specialist who understands Gaucher’s or another mom or dad just to reach out and ask questions and cry to. FIND SUPPORT: We have a private support active Facebook group where you can share your story, ask questions, and vent your frustrations – contact me for the link! Sorry, no researchers, physicians, students, etc. will be added to this group. Please also join us on our public Facebook page by clicking here. We, the Gaucher type 2/3 community, may be a small one. But we are a strong one, and we are a supportive one. Just let us know you are out there. Contact me if you want help, support, or a place just to “be” with other Gaucher families. Hannah passed away three months ago today. Woke up this morning to a text that Olivia, one of Hannah’s soul-sisters with Gaucher’s type 2, passed away. She had just turned 3 years old a couple of days ago. Today was to be her birthday party, a huge celebration for such a sweet little girl. I wish I had something poignant to say right now, something that expresses how angry and how devastated I am about Olivia. She and Hannah looked so much alike, especially when they were younger. They really could pass as sisters. Right now, I’m just really, really sad. I have met so many wonderful families with children diagnosed with Gaucher’s disease types 2 and 3. Some children that we have lost like Ethan, Kyle, and Niama who have never left my heart, and then there are others still fighting like Addy and Olivia who I have become so attached to that I feel like they are part of my family. I have recently met another family with a sweet little girl just diagnosed with Gaucher’s type 2. Like Addy and Olivia, I have really become attached to her adorable smile and touching personality. Meet Stella, her mom Kara, and her dad Dave. Beautiful little Emilka from Poland lost her battle with type 2 Gaucher’s disease. She was just 14 months old. I emailed with her mom a few times. She is an incredible advocate for Emilka. The Children’s Gaucher Research Fund (CGRF) is currently reviewing research proposals and is considering the funding of between $300,000 and $600,000 in scientific research. The dollar amount of funding will be dependent upon the quality and the compelling nature of the submitted proposals. The CGRF released a “Call for Research” on July 10, 2010, encouraging investigators from around the world to submit scientific research proposals in an effort to find a cure for neuronopathic Gaucher disease. Eleven research proposals were received from scientific laboratories in England, Israel, Italy, The Netherlands, and the United States. Members of our Scientific Advisory Board as well as peer review from investigators outside of the Scientific Advisory Board are currently in the process of reviewing these proposals for potential funding. In years past the CGRF has released similar “Calls for Research”, however the response in 2010 has far surpassed previous interest. This is a testament to the fact that science is accelerating – more is being learned about these brain diseases in children – and more scientific laboratories have an interest in pursuing avenues that may lead to a cure. These advances in medical science are compelling, and it gives the CGRF further motivation to continue in our quest to raise funds to support this important research. It is your donations that fund this important research – donations can be made online at www.childrensgaucher.org. We truly appreciate your continued support. 100% of donations received by the Children’s Gaucher Research Fund go directly to Medical Research. Little Olivia, Sweet Olivia. Life with type 2 Gaucher’s. This beautiful sweet face is Olivia. She was diagnosed with Gaucher’s Disease type 2. I have talked about her any times on here (including my last post, I believe). She and Hannah have so many similarities, both in presentation of symptoms and, well, they just look very much alike! I call Olivia Hannah’s “soul sister.” She has totally captured my heart. 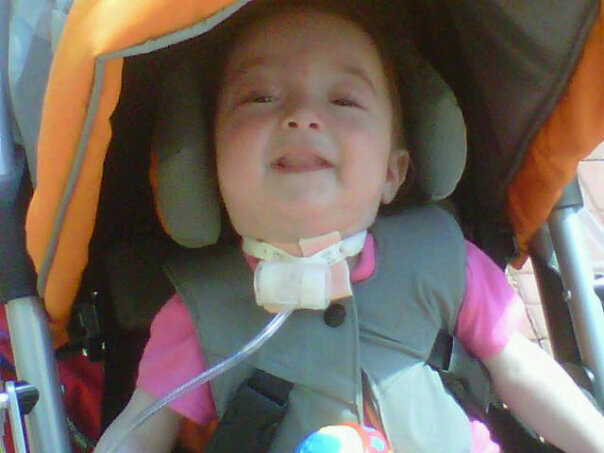 She recently spent her first birthday in the hospital getting a trach. If she did not get the trach, she likely would not be with us today. This disease is so horrible. I could share more about Olivia and her mom’s fight for her, but with her mom’s permission, I will let her mom, Melissa, tell you herself. Over the past few months I’ve been posting positive thoughts, pictures of Olivia peaceful and smiling- and all of that is True… only its not all the time. I know that most of you understand the complicated reality that is Olivia’s life. Recently I’ve found myself reaching again, attempting to make one more “Hail Mary Pass,” calling scientists at my job- maybe they might have something for me, and hopeful that there will be a miracle… maybe there will be. I have my mom setting up a Novena to Terrence Cardinal Cook- many of you have been praying for his intercession already… but I think perhaps a more organized attempt might work. I will let all of you know when/where that will be- if you are not Catholic and do not believe in organized prayer or intercessions- I ask that you just pray during the same time as the novena for a complete healing of Olivia and a cure for Gauchers. Reality though, if there is not a miracle Olivia’s life will be cut much shorter than any of us had expected. Every day now I am hit with something- albeit a drop in O2 sats, a blue face out of nowhere, a fever, hand and leg tremors, spastic episodes. For those of you that may not understand what I mean by spastic episodes I will explain. As a result of Olivia’s central issues, her brainstem is not functioning and is triggering episodes where her body completely tenses up (think charlie horse all over) causing her back to arch, and all of her extremeties to become so rigid she can’t control movement at all, also causing her larynx to completely tighten shut- a laryngospasm- preventing her from breathing. Now that she has had a tracheostomy- the laryngospasm no longer causes a breathing issue- but you can tell she still has them. We have her on a medication that will relax her but in the last two days its not working… last night she had these spastic episodes every few minutes or so until she finally was able to fall asleep. (About two hours) During these episodes, she cries silently, because of her trache she can’t produce sounds yet. Tears fall down her cheeks- and holding her only comforts her briefly… there is no medication, no bath, no song, no book, no hug that will make these go away. My fears are that sooner than later Olivia will begin to have respiratory issues. Just recently she has not been able to hold her saturation while she is sleeping- no matter how much O2 we give her. She seemed ok after she had been nebulized with Albuterol- but the worry is there. Her condition also threatens her ability to breathe… as the disease progresses the brain will stop telling Olivia to take in a breath… central apnea. My nurses have noted irregular breathing patterns while she sleeps- but she has had that for some time now. I’ve been sad lately, my mind consumed by Olivia and trying to create awareness…but as I’ve learned over the years- and especially from Olivia… Smile- Always! I know that this may be hard for some of you- but I wanted everyone to understand that Olivia, and babies/children with Gauchers, MPS, Pompe, MS, Cystic Fibrosis… all chronic diseases suffer more than most of us that are healthy could even fathom. There is no 6 mos protocol with a 99% cure rate at the end… there is no cure, these children are sick, and they are suffering. But through it all- if we learn anything, although they are suffering they still know to laugh, play, sing, dance, and love. Live your life to its fullest, be grateful for what you have, count your blessings, and appreciate your friends and your loved ones. Hannah and I love you, Little Miss Olivia.